You may notice I haven’t posted here for a while – I’m afraid it’s not for lack of trying – this post was written in the first week of December, and it has taken me until now to actually get the photos in! Life, it seems, gets in the way of blogging. A few weeks ago my daughter announced that she is going to be a Chinese child in the school nativity play (they are doing an international theme, so the kids are dressing up as children celebrating Christmas with different traditions from around the world.) The school asked us to provide a costume, and as a busy working mum, I promptly forgot about it! I then remembered, the night before the costume had to be in school. So what to do? Well, initially I rummaged through all of her clothes, then her brothers clothes, then I rummaged through my clothes, but no, we had nothing in the house that looked remotely like a Chinese outfit. I did find a red t-shirt, and I was close to cutting out and sticking on some yellow stars, so that she looked like she was wearing the flag. I didn’t really like that idea though, so instead I rummaged through my stash looking for anything that might be considered remotely Chinese! 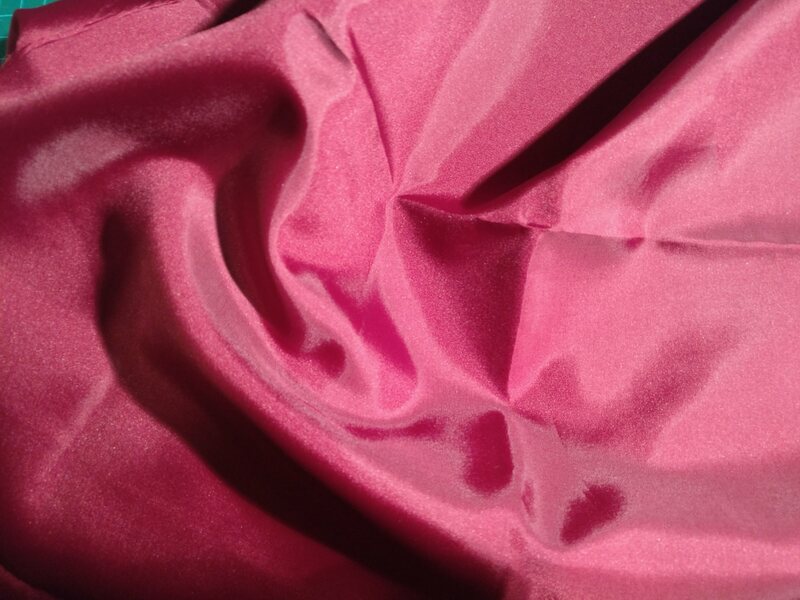 I ended up with some red silk (an old curtain, but beautiful material) but I didn’t really want to cut up some decent yardage to make a costume that’s only going to be worn for about an hour. 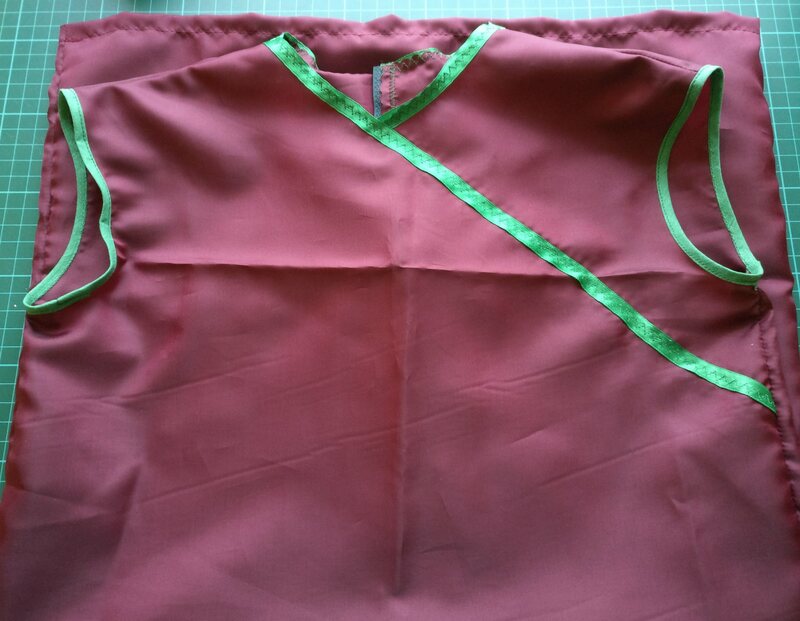 I then realised that I had some lining fabric to go with the silk. 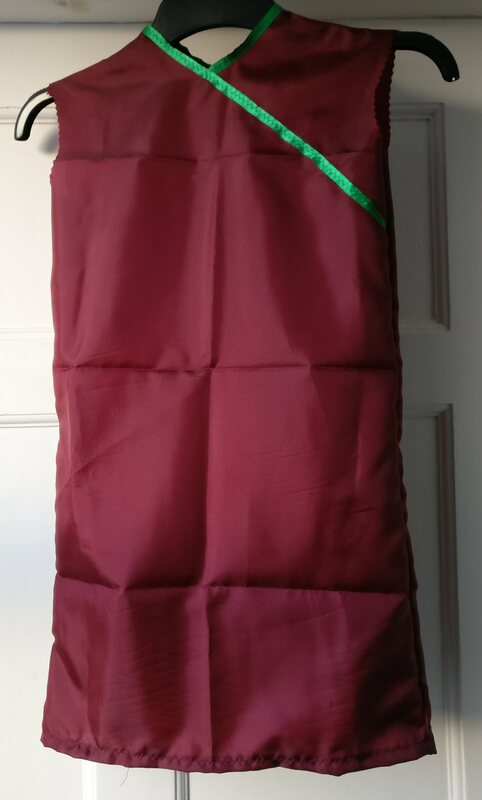 The deep burgundy lining looks quite rich and silky from a distance, so I decided that I’d use that. The material, however, is only half the battle. What pattern could I use? It was at this point that I started looking online at pictures of Chinese girls costumes, and then I was hit by an inspiration particle…I could use New Look 6090. I could lengthen the top to turn it into a straight shift dress, and if I used contrast ribbon on the neckline it would give the impression of a wrapped tunic style dress. At this point I realised that I only had about half a metre of the material, so not enough to make facings, or sleeves. The dress then became sleeveless, and following on from a discussion with Mr SewSmart I decided that I could leave the armscyes as raw pinked edges – this is, after all, only going to be worn for about an hour! Construction was incredibly simple; I cut the piece of material in half so that I had the maximum length of the front and the back of the dress. I cut out the front of the pattern – I didn’t mark any notches, or other pattern markings, and cut the side seams all the way down to the selvedge of the material in order to get the full length possible. 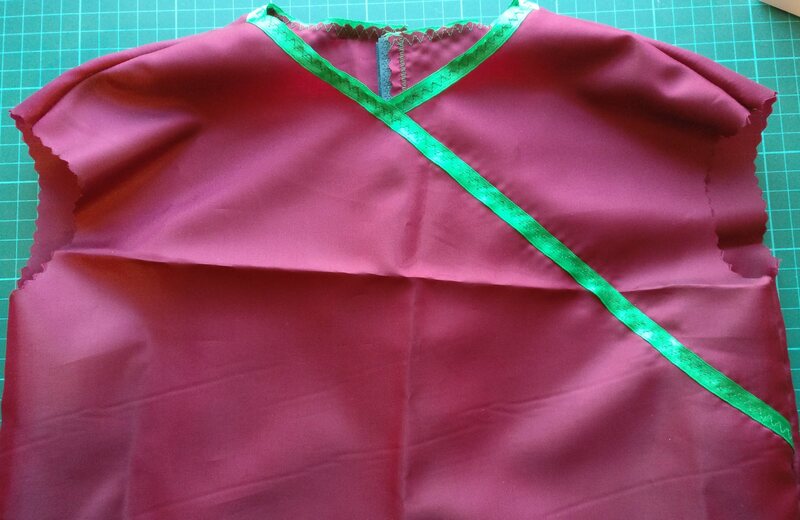 For the back of the dress, I cut the back pattern piece on the fold. 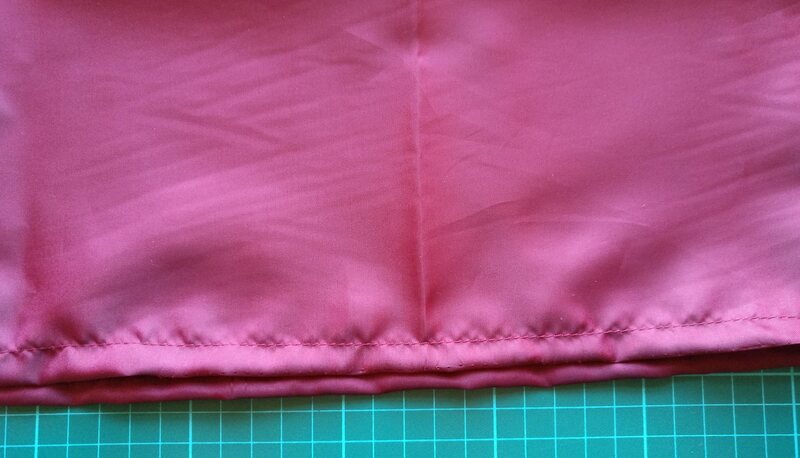 I did make a mistake here though in that I kept the seam allowance at the centre back, and removed it from the sides. This means that the piece is the right width overall, but the shoulders are set too far apart and the back neck opening is too wide. This isn’t a problem though as this dress only has to look reasonable for a short time, from a distance. I’m glad I learned this lesson on what is essentially a throwaway piece, and not on a dress that was to be treasured 🙂 I then sewed the ribbon around the neckline, taking the long front ribbon down under the armscye as described in the pattern. I used a zigzag stitch to catch the ribbon in place as it was quicker than doing two runs of straight stitch. 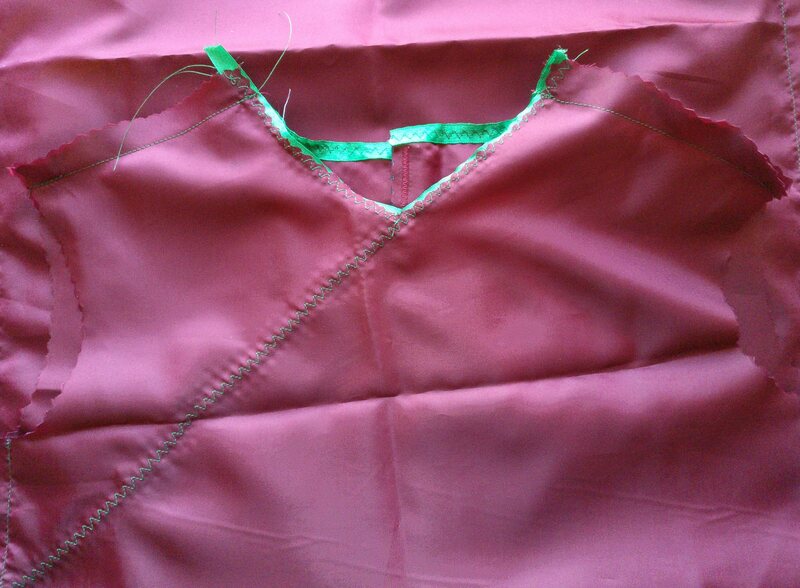 I then sewed the shoulder seams, and side seams. 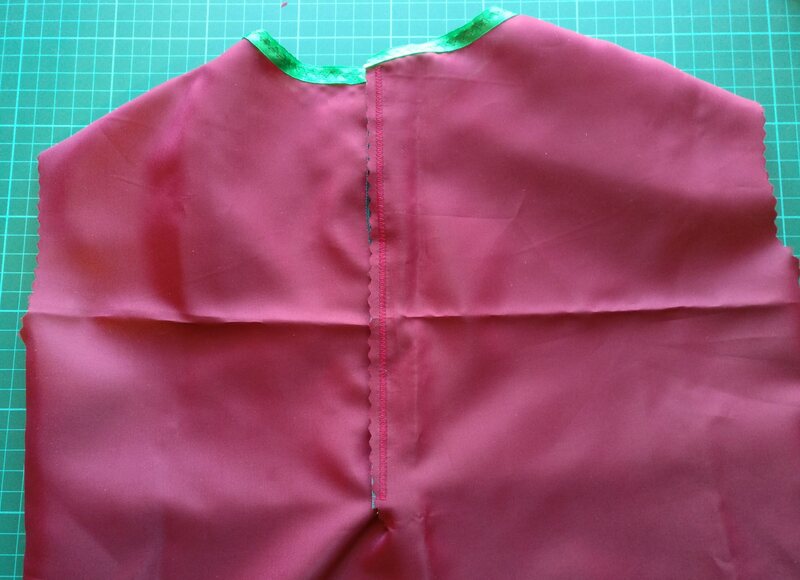 Once the main shape of the dress was in place I pinked down the centre back for about 20cm to allow my daughter to get the dress on and off, and zigzagged some Velcro in to place to secure the dress closed. Although this is very rough and ready, I did ensure that the hook side of the tape was facing away from her skin, with the fluffy side facing towards her skin. One quick try-on for length later, and I roughly topstitched the hem and the dress was good to go! It’s never going to win any prizes for pretty construction, but it is robust enough to survive for a little while and looks suitably Chinese. I think the biggest achievement for me though is that I actually managed to make it. I made something to fit the brief in a very short period of time – I think from start to finish, including finding the pattern and materials and coming up with the idea took about 2 hours. Because of the time pressure it felt a bit like a sewing bee challenge, and I’m really pleased to say I succeeded. My little girl thinks she looks like a Chinese princess; that to me is better than any judgement from May, Patrick and Esme! It was at that point that I realised that the costume didn’t need to be in school until Monday rather than the Friday as I had first thought. I decided to use the extra time to attach some contrast bias binding to the armscyes in order to finish them slightly more neatly. When the dress came back on Friday night I was slightly disappointed but I think if I had have realised that I had a whole weekend I would probably have just bought a costume and not tested my sewing skills and not had the immense feeling of satisfaction from succeeding in creating something. All in all I am really excited to have made this costume and I was really proud to see my daughter perform her part in the play wearing a costume that I made.